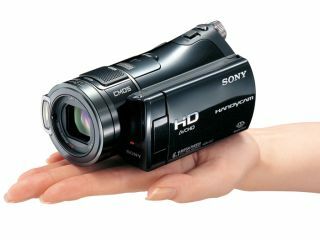 Good old Sony - never shy of claiming world firsts in the technology arena, the latest of which is the planet's smallest and lightest high-definition video camera: the HDR-CX7. It was announced for the Japanese market in Tokyo this morning. Previously revealed in the US, the HDR-CX7 uses the AVCHD compression technique we've already seen in several Sony and Panasonic camcorders. The ¥130,000 (£540) CX7 snares those world-beating crowns by sticking to solid-state storage instead of tape or a hard drive. Being Sony, the 450g, 69 x 67 x 131mm camera uses Memory Stick PRO Duo cards, with the HG variety favoured for its higher transfer rates. On the stats front, we're looking at a 1080i image, with a measly 1 hour of top-quality footage squeezing onto an 8GB card at the top rate of 15Mbit/s. Drop down to the LP mode of 5Mbit/s and the same 8GB will hold just shy of three hours of HD TV, which is more like it. Otherwise, the CX7 has a 6.1-megapixel resolution, a 10x optical zoom, HDMI output and a shooting time of just 45 minutes with the included standard battery. Thankfully, standby time is a little longer at 95 minutes and an extended battery that runs to 2 hours 55 minutes is available. This morning's launch also saw a couple of less novel camcorders join the CX7. Namely, the hard-drive-sporting HDR-SR7 (60GB, available next month in the US and Japan) and SR8 (100GB, Japan only). The smaller camera should sell for around ¥150,000 (£622), while the larger will be ¥170,000 (£704). Both AVCHD models and the larger SR8 can record over 38 hours of 1080i HD TV before filling up. UK releases should roll around by the end of the summer.